I can’t count the number of times I have heard foreign nationals complaining about the tragic loss of traditional Kyoto. It was one of the few major cities in Japan to be spared bombing of any sort at the end of World War II, and the fact that the old wooden buildings and roadways are mostly gone is due to the demands of modernization. But I don’t think Kyoto is the great tragedy of Kansai. I don’t even think it has really been lost, as most of its culture and traditions are still intact, its arts are still practiced, and it is respected as the cultural center of Japan by almost all, despite the considerable legacies of places such as Edo and Osaka. And regardless of its considerable size and the laws that make preservation of wooden structures difficult, Kyoto has still managed to maintain a significant amount of its architectural legacy. The real tragedy of Kansai is the city of Sakai, which has become a dreary southern-Osaka suburb and a manufacturing center. Urbanization and modernization have not only created a city that is, for the most part, run-down and depressing, its has chiseled away at the cultural legacy of Sakai to such a degree that most Japanese don’t even know of the city’s importance in Japanese history and culture. One of the more well-known facts about Sakai is that it has historically produced the best-quality blades in Japan, and most consider it to be one of the great centers of blade production (mostly cutlery in modern times) in the entire world. Sakai swords will set you back nearly a life savings, and genuine swords today are considered national treasures, and thus cannot be legally taken out of the country. Sakai was also a pioneer of early bicycle manufacturing in Japan, and even now produces are large amount of Japan’s bicycles. There are many crafts still done by hand in Sakai, including dying of cloth, painting of koi-nobori (Sakai is one of the rare places where this is still done by hand), and wood carving. And let’s not forget one of the most influential cultural legacies to come of out Sakai, the tea master Sen no Rikyu, who was history’s most influential figure in developing and solidifying the art of Japanese tea ceremony–he was important enough to be the personal tea master of both Oda Nobunaga and Toyotomi Hideyoshi, two of history’s greatest shoguns and rulers. Sen no Rikyu was held in such high esteem that he helped host a tea ceremony for the emperor, and was bestowed with an honorary title as a result. And if Sen no Rikyu isn’t enough to impress you, try opening Google Maps and taking a look at some of the largest ancient imperial tombs in existence (in carefully executed keyhole shapes, large enough to be seen from space), which are scattered here and there throughout Sakai City. When excavated, these tombs contained some of the most valuable artifacts from ancient Japan that have been found, revealing a massive amount of information about ancient Japanese history, art, culture and lifestyle. And the reason these tombs are in Sakai? Because that region is where the emperors first reigned over Japan, long before Nara and then Kyoto became the capitals in the late 8th century AD. Sakai started as a fishing village–many of the temples and shrines, including the impressive Sumiyoshi Grand Shrine, are dedicated to deities said to grant safety at sea. It later developed into a merchant town, much like its bigger neighbor Osaka, except that in the case of Sakai it was an autonomous, self-governed body (a “free city,” or 自由都市)–this was also the case with other cities in Japan at the time, including the thriving merchant town of Hakata in Kyushu. It was during this time that all the skilled crafts and arts, which are still around today but greatly under-appreciated, began to develop rapidly. Sakai was also growing into an important trade hub during this time (mostly domestic trade). Around the time of the Meiji Restoration (1868), Japan was following a similar path of “modernization” to that of Europe and the United States, but it had to industrialize more quickly in order to keep up with the world’s other top powers and avoid falling prey to imperialism. This meant that cities like Sakai grew quickly, and factories started sprouting up here and there, polluting the air and making for the start of what would come to be a dreadful cityscape. Like many other cities, Sakai was firebombed by allied forces (mostly American) near the end of World War II–according to Wikipedia statistics, 48.2% of the city was destroyed. The postwar period of high-speed growth in Japan led to further industrial development of Sakai, and today there are many large artificial islands filling the bay. Although it is better than in recent years, Sakai has not seen the shift toward a commercial rather than industrial economy as Osaka has, and smoke and sulfurous smells still fill the air near the bay. Today, Sakai aims to become a model environmental city for Japan, and the national and local governments have put money and effort into achieving this end. Promising projects, such as the collaborative solar plant and factory project recently built by Sharp and Kansai Electric Power, do make it seem as if real effort is being made, but a visit to the city makes it painfully clear that Sakai still has decades (at least) before it can revert back to being a cultural icon and highly livable city. Personally, I don’t think building more is the answer; I think reducing polluting industries, expanding transportation infrastructure, enhancing technologies to cut down on pollution, and drawing in non-polluting business will be a start toward the model “green city” goal. The building of a new national (and international) soccer training facility in Sakai is seen by some as a promising new direction, especially considering its convenient location near Osaka City and Kansai International Airport. Let’s not let this unique and fascinating gem of Japan slip away through negligence. I truly hope that Sakai, a casualty of development and centralization, will one day return to its former glory. At the very least, I hope it will not be forgotten. Check out the Sakai Tourism and Convention Bureau’s sightseeing guide and Sakai City’s sightseeing guide, or stop by a tourism information center at one of the major JR or Nankai train stations where information is available in English and other languages. For those who haven’t experienced it, the fiery colors of changing autumn leaves in Japan are a magnificent thing to behold. Momiji-gari (autumn-leaves viewing) is just as popular as cherry blossom viewing in the spring, and televised weather reports include the status of leaves in Japan as they change–a sort of “autumn leaves front” moving from north to south through Japan. For information on when the leaves will be at their best for each region, as well as detailed information and up-to-date reports, check out the helpful info at Japan-guide.com, one of my favorite resources for anything related to sightseeing in Japan. Although this site does not list information on Osaka (although it does include surrounding areas such as Kyoto and Nara), I can personally recommend Minoh Park as a great spot to see autumn leaves. If you want to stay in Osaka City, Osaka Castle Park is a good option. November is the best time for viewing in Kansai. So far I’ve spent a lot of time talking about what there is to do in Osaka, but this time I want to give a quick overview of places that can be visited as day trips from Osaka. It is, in fact, the perfect city for this, because of its central location and its function as a transportation hub for the Kansai area. The obvious destination is Kyoto, which is by far the most popular tourist destination in Japan among both domestic and international tourists. Then is nearby Nara (the imperial capital from 710-794, before it moved to Kyoto), which like Kyoto is home to a number of famous temples and shrines including Todaiji, Koryuji, and Kasuga Taisha. I prefer Nara over Kyoto because it feels more genuine and is not as crowded. Kobe is known as a pleasant, cosmopolitan city with an international feel–I recommend the waterfront Meriken Park, which is a romantic hot spot at night. Then there’s Himeji, with its soaring castle that is more famous and impressive than any other in the country. If you’re looking for something new, why not try Wakayama City? It has a number of gorgeous old temples, some great food, and lovely beaches and hot spring areas. Iga, one of the two great ninja towns of Japan (the other being Koga in Shiga Prefecture), is located in Nara Prefecture and features a ninja museum that you’re sure to get a kick out of. Kumano Kodo, a pilgrimage route that has been celebrated since ancient times, has recently become popular after being named as Japan’s newest UNESCO World Heritage Site. Yoshino is famous for its autumn colors and spring cherry blossoms, and also has a number of lovely old ryokan and baths. Further east is Ise Shrine (in eastern Mie Prefecture), the most important Shinto shrine in Japan. It is connected to the imperial family, and it has been rebuilt every 20 years on alternating lots using the same architecture and materials since the beginning of Japan as a unified civilization. Yes, there are even ninjas inside the ninja train. Heading north from Osaka, you will find Uji, which is famous for it matcha powdered green tea, and also for Byodoin, a graceful temple that is meant to be an earthly re-creation of the Buddhist paradise (you can find it pictured on the ten yen coin). Fushimi-Inari Shrine is a complex winding its way up a mountainside, featuring paths lined with thousands of bright-orange torii gates that create an impressive tunnel-like effect. The Lake Biwa area is also a treasure trove of great places to see and delicious foods to eat (read about my journey around the lake here). There are more options available, but the places listed above are all great destinations for day or weekend trips out of the city. With the autumn leaves reaching their colorful peak, now is the perfect time to experience the many faces of the Kansai region. Kansai International Aiport (KIX) is the second most important airport in Japan (after Narita in Tokyo) and the main airline hub for the Kansai area, which includes Kyoto, Osaka, Kobe, Wakayama, and many other large cities. KIX is located on an artificial island in Osaka Bay, near Sennan and Izumisano Cities in southern Osaka Prefecture. It is connected to the land by a 3 km (2 mile) bridge that carries rail and road traffic, and also by ferry services. 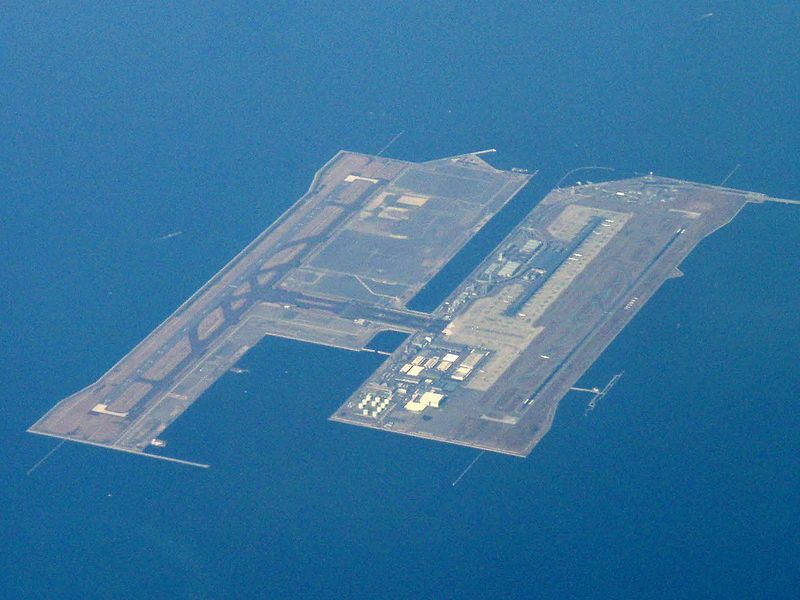 The island built for this airport turned Osaka Prefecture, formerly the smallest prefecture in Japan in terms of land area, into the second smallest in Japan, putting Kagawa Prefecture in last. There have been problems with the island sinking slowly each year, but they have been mitigated for the most part, naturally and due to technological innovations. Fear of strong crosswinds affecting rail traffic has also been assuaged through installation of protective barriers. KIX survived severe typhoon winds and the 1995 Great Awaji-Hanshin Earthquake without significant damage. The airport was designed by world-famous Italian architect Renzo Piano, and the terminal is the longest in the world at 1.7 km in length (it is served by a tram/train). There are two runways, and a third is planned as part of a future expansion. KIX has a good variety of restaurants and facilities, and just across the bridge is Rinku Town, one of the most extensive and entertaining shopping areas in all of Osaka Prefecture. You can also stay in the ANA Gate Tower Hotel at Rinku Town, located in the Rinku Gate Tower Building, the second tallest building in Japan after Yokohama’s Landmark Tower (Rinku Gate Tower is the same height as Osaka City’s WTC Cosmo Tower). KIX is about 35-45 min. by limited express train (JR or Nankai Railways) from central Osaka City, and JR trains continue through Osaka all the way to Kyoto. Check out KIX’s website here. When you visit Osaka next, come through Kansai International Airport and learn why it is considered on of the best airports in the world. Here is another good post on KIX that focuses more on the interesting architecture design of the airport and contains a number of terminal-building photographs. Makino was the turning point in my journey, the non-climactic climax of my loop around Lake Biwa. The pedals moved smoothly on the bike I had borrowed from the hotel, and I glided effortlessly down the narrow lakeshore road, dodging cars and pedestrians on a lane too narrow for either. I passed ancient wooden gates protecting majestic temples, mixed in with old wooden houses belonging to anglers, farmers, and wealthy individuals lucky enough to have summer homes. There were bright green paddy fields and dull gray boat ramps, small shrines and old tea shops. There were also staring eyes, especially when I stopped to take a picture of something that seemed perfectly normal to local residents, such as a beautiful field or the sunset dipping over the lake. Why was Makino a climax, a turning point in my journey? Well, in the physical sense, it was the halfway point of the loop I was taking around the lake, and the point from which I started heading back toward Osaka rather than away from it. It was the place where I experienced my first and only disappointing hotel of the trip. It was also the least urban, most rural place I had been so far. But more than that, it was the people who were different: the scenery of Makino was friendly, but unfortunately, the people were not. This was a different Shiga than I was used to. Speaking of the hotel–I won’t mention the name out of courtesy–it was a giant disappointment. This was the only luxury hotel I was to stay in, right on the lakeshore and at twice the cost of the other business hotels I had stayed in thus far. However, its location was bad (15 minutes walk from the station through the middle of nothing with no pickup service, which is unheard of in Japan); its carpets were stained everywhere; its bathroom had random hairs stuck all over it; the swimming pool was much smaller than its picture made it look, filled with dirt and spots, and not open for use once the whole time I was there; the “private beach” smelled like garbage and dead fish; the “bar” and “restaurant” were identically plain (cheap folding chairs and cheap plastic tables in front of a large window looking out at said smelly beach); the staff were unfriendly, unhelpful, and uninterested; and my view was of a pile of concrete slabs, pipes, and tools strewn about. But I was thankful for the bikes. Because of delays arriving to Makino I had to change my schedule around a bit, but after checking out from my hotel (good riddance) and trudging back to the station, I was on the train for Katata. After calling the Katata tourist information center and conforming that there were in fact lockers at the station, of course. I felt a tinge of sadness as I rode the nearly empty train southward, near the west shore of the lake. Tomorrow I would be heading back to Osaka. While my feet hurt and the prospect of my own bed seemed nice, the idea of my vacation ending and “real life” starting again made me a little blue. On the other hand, I was looking forward to the day’s sites and also to a scalding hot spring bath that night. The first thing I noticed about Katata was the people were different from those of northern Shiga. They were much more friendly. The bus driver really helped me out, stopping the bus as the stop where I got off and coming down to the street to point the way to the place I was looking for. He was a really friendly guy overall, and without him I would have been lost in Katata. The main site I visited was Ukimido (can be translated to something like “floating Buddha hall”), which is a structure that is built on stilts out in the middle of the water, and is part of Mangetsuji Temple. The structure was built by a monk from Enryakuji Temple (a temple on Mt. Hiei) about 1000 years ago, and the current structure is from 1937. It is probably the most celebrated spot in Katata, and it’s easy to understand why–it floats perfectly on the surface of the lake, surrounded by beautiful pine trees, providing a truly calming sight that brings one’s thoughts to things spiritual. I also dropped in at nearby Honpukuji Temple and walked around the surrounding neighborhoods, which were charming. My next destination was Ishiyama-dera, one of the most famous temples in the Otsu areas. I took the train to Yamashina and from there rode the Keihan line through the mountains and along its steep, winding course into Otsu, where I transferred for another local line that led me to the bottom of a hill near Ishiyama-dera. This is one of the temples of the Saigoku Piligrimage route, buried in a forest on the side of a steep, craggy hill. The gurgling of water over moss-covered rocks, quiet stillness of the forest, and chirping of birds complemented old buildings that seemed as if they had been there since the beginning of time. A truly magical and mysterious aura floated through the grounds of Ishiyama-dera, one that transported me as a visitor to another world until I reached the top of the hill, looked out over the city, and remembered that Iwas, in fact, in modern Japan. There are buildings here that are more than 800 years old, and one of the rooms there was used by Lady Murasaki when she was writing The Tale of Genji. As I was sitting on a bench near the summit, a couple of people came over and talked to me, and two older ladies even asked to have their picture taken with me. One of them was from Osaka, the other from Okinawa, and the latter said she was planning to visit the American west coast later that year. After I took the long way around the vast temple grounds, I finally made it back to the entrance and caught a bus back to a Keihan Line station, continuing from there back to Yamashina where my luggage was stored. I spotted a Starbucks near the station, something I had not seen for days, and decided it was time for a cup. After resting there and reading my book for a while (I was currently reading Itoyama Akiko‘s Fukurokoji no Otoko), I headed back to the station, only to have yet another lady I didn’t know come up and talk to me. Apparently she talked to me without taking a good look at my face first, because partway through she stopped when she realized I was a foreigner, assuming I wouldn’t understand. I assured her in Japanese I had no trouble speaking the language, and we actually stood there and talked for about an hour in front of the train station ticket machines. She was apparently studying English, but she was glad to talk for the first time to a foreigner in Japanese (beyond the level of “konnichiwa,” “I’m 26 years old” or “where’s the bathroom?”), something that is rare in Japan. It turned out she was a Jehovah’s Witness, and I politely declined her offer to come to her church, she was one of the most interesting people I encountered during my trip. That night I stayed at Ogoto Onsen in a nice hotel with indoor and outdoor hot spring baths built in. In contrast to my last hotel, the staff were waiting with a bus when I arrived, and we followed winding, woody road up to the top of a hill where the hotel was located. The staff were courteous, and the baths felt wonderful after four straight days of traveling and walking through mountains and towns. It was at this hotel that I met the dreaded “slipper obaasan” (“slipper granny”),as I have decided to name her. What is the slipper obaasan? Well, she is an old lady who wears a yukata and works in the hot spring public bath section of the hotel, and her job is apparently to make sure people wear their hotel slippers when they walk down the corridor leading to the bath. During check-in, they had mentioned that I needed to wear the hotel slippers when going to the bath, but when I got to the room, I found that the slippers were about 2-3 inches shorter than my foot. I called the front desk, but they had no other size. Nice. In the end, I put on the yukata and walked to the bath sans slippers, only to encounter the slipper obaasan along the way. When she saw that I didn’t have my slippers, she flashed the giant X-shaped dame sign with her arms and started freaking out at me–I kind of thought she was going to rip my head off. With impeccable timing, the young girl from reception saw us and intervened, saying I could go for now and she would find a pair of soft room slippers for me to use and put them outside the bath. When I had finished bathing and was in the changing area, still not clothed, the slipper obaasan walked nonchalantly into the room full of naked men, stood in front of me, and told me my slippers were waiting–I think she had been worrying terribly about this, which I suppose was her job. She even stood outside to make sure I actually wore them, and followed me all the way down the hall as I left. The slipper obaasan got mad at me for not wearing these slippers. Reasonable? I think not. Refreshed after a nice bath–there was even one bath outside that had water falling at close intervals from above, so it hits your shoulders and feels like a massage–I returned to my room and took in the gorgeous view of the lake from my window. As the sun set, the lights of the cities clinging to the shores of Lake Biwa and the few fishing boats still out in the water became the only things that were visible. After breakfast the following day I would return to Osaka. My trip around the lake was finished, yet I still felt there was so much to see. I never had the chance to spend time in Takashima or Imazu thanks to JR delays, I still wanted to visit the ninja town of Koga on the east side of the lake, and I had never been up to Mt. Hiei or to Mii-dera in Otsu. But I suppose that’s be best part about Shiga Prefecture: there’s always something new to discover. See part 1 and part 2 of the journey. To see a map of my journey, click here. Because of delays arriving to Makino I had to change my schedule around a bit, but after checking out from my hotel (good riddance) and trudging back to the station, I was on the train for Katata. After calling the Katata tourist information center and conforming that there were in fact lockers at the station. I felt a tinge of sadness as I rode the nearly empty train southward, near the west shore of the lake. Tomorrow I would be heading back to Osaka. While my feet hurt (I am still recovering from and injury that makes it hard to walk) and the prospect of my own bed seemed nice, the idea of my vacation ending and “real life” starting again made me a little blue. On the other hand, I was looking forward to the day’s sites and also to a scalding hot spring bath that night.